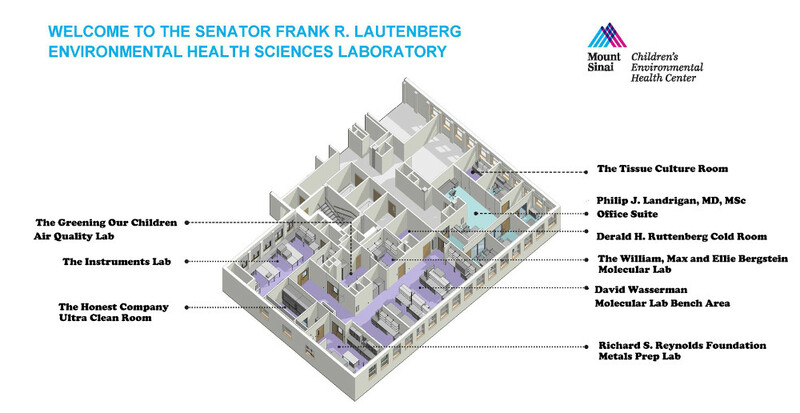 The Senator Frank R. Lautenberg Environmental Health Sciences Laboratory, directed by Robert O. Wright, MD, MPH, is a shared facility between The Mindich Child Health and Development Institute (MCHDI), the Children’s Environmental Health Center (CEHC), and the Environmental Medicine and Public Health at Mount Sinai. Additionally, the Lab has partnered with the Transdisciplinary Center on Health Effects of Early Environmental Exposures (TCEEE) as an Integrated Health Sciences Facility Core (IHSFC). The Center’s mission is to understand how environmental exposures in early life influence health, development, and risk of disease and dysfunction across the life span – in infancy, childhood, adolescence, and beyond. Through our clinical and community partnerships, we will translate our research findings into evidence-based approaches for disease prevention and treatment. The David Wasserman Molecular Lab Bench Area enables researchers to carry out sophisticated analyses that identify biomarkers of environmental exposures. This area features an open design and is comprised of state-of-the-art lab benches equipped with cutting-edge technology for DNA/RNA preparation. Ultimately, the work conducted in this area will allow researchers to better understand windows of susceptibility that lead to disease. The Derald H. Ruttenberg Cold Room is specially designed to prevent the degradation of samples and ensure valid results. The room is fitted with equipment to maintain the temperature of 4° Celsius, which enables researchers to process delicate biological samples – such as blood, tissues, and cells – which are sensitive to higher temperatures. The Philip J. Landrigan, MD, MSc Office Suite is the administrative hub for the Lab’s research activity, housing experts in both analytical chemistry and molecular biology. By situating researchers from different disciplines in one common office space, collaboration is encouraged and new ideas are spread. The Richard S. Reynolds Foundation Metals Prep Lab ensures that samples are prepared properly for the most accurate results and is where the most critical steps of the trace metal analysis process are conducted. The Metals Prep Lab is fully equipped with state of the art scientific equipment, HEPA filtered air supply, and epoxy painted walls to minimize contamination. The Greening Our Children Air Quality Lab enables researchers to analyze the small particles that comprise air pollution and thus will provide critical information about the links between exposure and a variety of health outcomes. The Honest Company Ultra Clean Room is the “gold standard” in analytical chemistry laboratories. It is equipped with technologies that significantly reduce the risk of sample contamination and allow researchers to measure extremely low levels of exposures – even levels as small as parts per trillion. The Microscope Room holds a custom-built microscope with multiple fluorescent filters that can scan up to eight slides. This allows for fast, automated imaging of multiple samples – increasing the pace at which research is conducted. The room also holds a micromill, a high-resolution sampling device that uses a small drill to mine discrete areas of solid samples. The Tissue Culture Room carries out functional investigation or validation of biomarkers that may be associated with environmental exposure or disease development. Overall, tissue culture is an important tool for the study of the biology of cells from multicellular organisms and also for the influence of external factors. Tissue culture can be easily manipulated and analyzed to provide comprehensive results. The William, Max and Ellie Bergstein Molecular Lab supports DNA and RNA extraction, providing critical epigenetic information about how environmental chemicals can “program” us for disease later in life.